West Bengal is home to several beautiful and tiny islands which are yet away from commercialisation. So, why not explore the nascent beauty of these places while they are still uncrowded and pure? Henry's Island is one such place in the southern part of West Bengal which is a perfect destination for offbeat travellers. Known for its untouched beaches and rich wildlife amidst greenery, Henry's Island is an ideal weekend getaway from Kolkata. So, how about planning an exciting trip from Kolkata to Henry's Island this weekend? Being a seaside beauty, Henry's Island can be visited throughout the year. On account of its cool atmosphere and unpolluted environment, it is a year-round destination. However, if you are looking forward to witnessing the beauty of Henry's Island at its summit, then the best time is from September until the end of April. By Air: The nearest airport is at Kolkata only which is located at a distance of around 125 km. By Rail: You can catch a train from Kolkata railway station to Namkhana railway station and then from there you can hire a cab to Henry's Island, which is located at a distance of around 25 km from Namkhana. By Road: Located at an approximate distance of 125 km from Kolkata, Henry's Island is easily accessible by road. While on your way to Henry's Island, you can take a break at Bishnupur and explore the architectural beauty of the town. Located in the Bankura district, Bishnupur is famous amongst tourists for its ancient beauty in the form of terracotta temples and other buildings. Bishnupur is also known for its Baluchari sarees, which have beautifully depicted mythological drawings and shades on them. Being an ancient place with the history dating back to the Gupta Empire, it is expected from Bishnupur to have historical monuments which will certainly compel you to commend their architectural splendour. So, if you desire to look back in time, then Bishnupur is a perfect stoppage for you. Eventually, you will be on the pristine Henry's Island after covering a distance of around 125 km. Once you are within the boundaries of Henry's Island, you will be free to open your wings and fly around the serenity and tranquillity of the island. Henry's Island is located in the South 24 Parganas district of West Bengal. Popular for its virgin beaches and mangrove forests, Henry's Island will definitely be a surprise party for you. Following are some of the major things to do when on Henry's Island. Henry's Island Beach is a synonym to freshness and unblemished environment. So, who would not love to spend some refreshing time amidst the greenery and relaxing waters of its beach? If you are tired of visiting crowded beaches and are looking for a beach in seclusion, then Henry's Island is definitely a paradise for you. How about taking a stroll on its beautiful beach surrounded by mangroves? If you have been to Henry's Island and did not experience its panoramic beauty from the watchtower, then you must consider visiting Henry's Island again. From the watch tower, you can capture some of the best shots and witness the unseen and hidden charm of Henry's Island. The spectacular views of the Mangrove forests with the blue backdrop of the sky should not be missed. 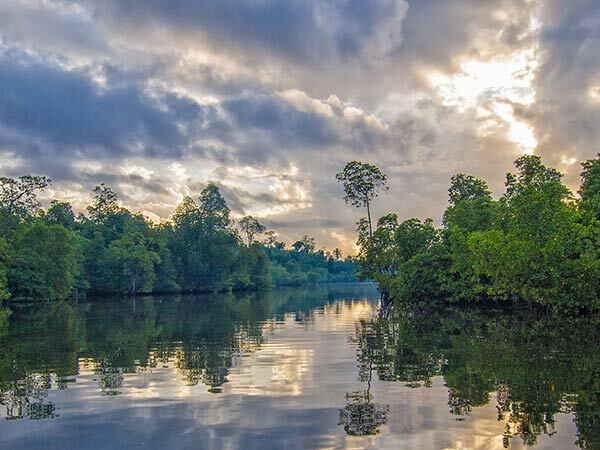 Another interesting thing which can be done on the lands of Henry's Island is certainly exploring its diverse wildlife, which is spread across the mangrove forests. You can also spot several beautiful birds and millions of red crabs in and around the region. Do not forget your camera if you are planning to take home several everlasting memories. Apart from all these things, you can also try your hand at adventure sports in the roaring waters of the sea. Even though the large waves hit the shore at irregular intervals, several adventure seekers still try to challenge these waves and play in its waters. If you are a beginner, then it is advisable to not swim or bathe here due to the irregular current of the waves.